PANEL SLOTS AVAILABLE for 5/9/19 - 9 books to choose from! If all slots are filled, you are welcome to be part of the audience and Party with us! SIGN UP for a half-hour show to discuss and answer questions about a favorite book. We need at least three or four teens to make up a panel (but the more the merrier, it's a party!) before we can schedule filming of our Book Party TV show. Invite your friends to join in on the discussions. 1. Scroll down to the date available or the You Tell Me section and click in little Sign Up box. 2. Then hit Submit and Sign Up button at bottom of page. 3. Then enter the title AND author of the book you'd like to discuss if filling out the "You Tell Me" section or just fill out your first name and ONLY last initial in the contact information and click SIGN UP NOW at the bottom. Your email address will remain private. 4. 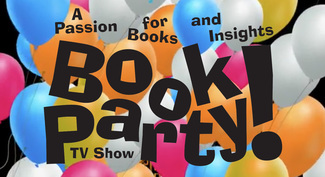 Please e-mail me at [email protected] to confirm your sign -up and to let me know your parents approve of you being on a panel on 'Book Party' TV show.